When you look at the sky, you will see different cloud formations. How many types of clouds do you know? You are probably familiar with the main cloud types. However, clouds are further classified into species, varieties and even supplementary features that appear with the main cloud types. Understanding the different cloud formations is very important to help you foretell and prepare for the upcoming weather system. Why are there Different Types of Clouds? The reason why you see different types of clouds in the sky is because clouds form at different elevations and temperatures. They may contain water droplets, ice crystals or a combination of both. Clouds get their shapes from the surrounding air which frequently changes; at one point they are calm and sometimes very windy. Winds always push and pull at the clouds, pressing and stretching them toward different directions. That is why clouds come in different forms and shapes. In fact, they are classified according to an assortment of genera or main groups, species and varieties. There are ten main types of clouds or genera grouped based on their appearance and height in the atmosphere. These clouds are found more than 6,000 meters (or 20,000 feet) from the Earth’s surface. High level clouds are primarily made up of ice crystals due to below freezing temperatures at the cloud level. These clouds exhibit a thin, white appearance and provide spectacular array of colors most especially if the sun run low in the horizon. High level clouds use the prefix “cirro”, a Latin word which means “wisps of hair”. 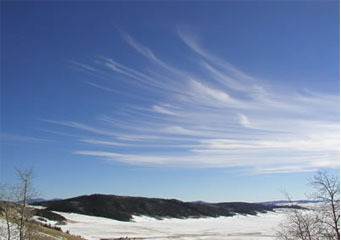 These clouds display a hair-like appearance in thin and white narrow bands or patches. Cirrus clouds are indicators of good weather. Cirrocumulus appears like cotton balls floating in the sky in white patches or sheets and without shading. The cloud elements could either be merged or separated and almost regularly arranged. Cirrostratus clouds are thin clouds spread across the sky and give rise to halo effect from the sun. These clouds exhibit smooth, hair-like white appearance and are strong indication of an upcoming rain or snow. These clouds are found at middle altitude anywhere between 2,000 meters and 6,000 meters (or 6,500 feet and 20,000 feet) from the ground. Middle level clouds are largely made up of water droplets though they may also be made up of ice crystals if the temperature at the cloud level is sufficiently cold. Clouds belonging to the middle level group have the Latin prefix “alto” which connotes medium level. These clouds are often confused with high level cirrocumulus clouds. However, unlike cirrocumulus, some parts of altocumulus clouds have gray-toned shade appearing either in patches or layers. Altocumulus is a good indicator of thunderstorm later in the afternoon. Altostratus appears as thin sheets or layers of clouds in gray or bluish hue that partly or completely covers the sky. This cloud type gives rise to hazy or fuzzy sky. A thickening altostratus cloud signals precipitation. Nimbostratus Clouds are classified under middle cloud level, though it may also appear in the lower cloud level. Nimbostratus is a featureless cloud formation appearing as thick, gray clouds covering the entire sky. These clouds produce heavy precipitation as either rain or snow. Low level clouds are found at lower elevations less than 6,500 feet from the ground. These clouds primarily contain water droplets although they may also hold ice particles under cold temperatures. Low level clouds use the prefix “strato” which is a Latin word for “layered”. These clouds appear close to the surface covering most parts of the sky and resemble fog. Stratus clouds have uniform bases in gray color which produce light drizzle. Stratocumulus is very common during overcast days and is identified as a low-lying cloud form. They appear in patches or layers of gray or whitish, with lumpy shapes and do not produce heavy precipitation. Clouds in this category occupy the three cloud levels with bases anchored at the low level and grow at greater heights over 39,000 feet from the ground. Clouds with vertical development use the prefix “cumulo”, a Latin word for “heap” or “pile”. Cumulus clouds are clouds showing gray flat bases with lumpy white tops like floating cotton balls in the sky. Although these clouds are often called fair water clouds, cumulus with dense gray bases are strong indication of impending rain or snow. These clouds are also called thunderstorm clouds because their formation announces an approaching severe weather system. This is especially true when the tops of cumulonimbus clouds exhibit an anvil pattern or domes indicating intense thunderstorm updraft. Clouds are also classified into species based on their shape, size and the arrangement of cloud elements. This cloud species only occurs in the cumulonimbus genus and is distinguished by the cap-like structure atop cumulonimbus cloud. Calvus is exclusive to cumulonimbus clouds and manifests whitish projections on the upper part of cumulonimbus cloud. This particular species exhibits cauliflower-shaped tops specific to cumulus clouds. These are clouds having tower-like projections which occur in the genera of cirrus, cirrocumulus, altocumulus and stratocumulus. Clouds having thin irregular filaments that mainly occur in cloud genera cirrus and cirrocumulus. Characterized by shredded cloud elements, this species occurs in cumulus and stratus clouds. Clouds of this species exhibit small bunch of cloud elements with shredded bases. It is found in cirrus, cirrocumulus and altocumulus clouds. Humilis shows slight vertical development and is only found in cumulus genus. This species only arise in cumulus clouds showing moderate vertical development. It has a hook-like appearance and is exclusive to cirrus genus. Stratiformis is characterized by extensive horizontal development that found in altocumulus, stratocumulus and sometimes, cirrocumulus genera. This cloud species appear like a veil with no sharp details. This occurs in the cirrostratus and stratus genera. It has adequate thickness with a tinge of gray and found in cirrus genus. These are clouds showing lens-shaped elements with clear outlines found in cirrocumulus, altocumulus and stratocumulus. Cloud genera are further classified into varieties and supplementary features. You don’t have to be a weather forecaster to predict the upcoming weather or be a professional cloud collector to value the different types of clouds. By understanding the various types of clouds, you can prepare for the kind of weather conditions they bring and appreciate the beauty of clouds in the sky.